Sandra Hindman is a leading expert on Medieval and Renaissance manuscript illumination. Professor Emerita of Art History at Northwestern University and owner of Les Enluminures, Sandra is author, co-author, or editor of more than 10 books, as well as numerous articles on history, illuminated manuscripts and medieval rings. 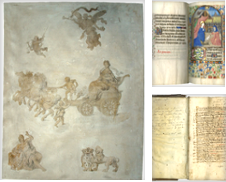 AbeBooks posed a number of basic questions about medieval manuscripts and Sandra was kind enough to answer them. 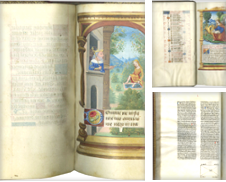 AbeBooks: What are medieval manuscripts? Should we think of them as books or something else? Sandra Hindman: "Yes. They are books written by hand (manu=hand; scriptus=to write). They are not printed." AbeBooks: What was the typical production process in creating a medieval manuscript? Sandra Hindman: "It wasn't easy to make a medieval manuscript. Specially treated animal skins, or parchment, were cut, stacked, and folded in half to form 'gatherings.' After ruling, a scribe wrote the text, and artists decorated and illuminated the sheets. Arranged in sequence, the gatherings were sewn, then threaded through channels in wooden boards, to make up the front and back covers of the binding. AbeBooks: We think of monks toiling away to make medieval manuscripts. Is this true? Sandra Hindman: "Only partially. Before about the year 1200, medieval manuscripts were made in monasteries by monks and sometimes nuns, who were scribes and artists working in the service of God. After around 1200 with the rise of towns and the growth of a money economy, production shifted to city centers. In places like Paris, Oxford, and Florence specialized professionals in the book trade (scribes, artists, binders, publishers) belonged to guilds and were paid for their work." AbeBooks: The medieval period spans from the 5th to 15th centuries - how is it possible that manuscripts from this period have survived so long? Sandra Hindman: "Parchment is a much more robust support than our modern paper. The natural ingredients of the ink and pigments were mineral or vegetable products, resistant by their very composition to change. Stored shut within hefty bindings, the text and paintings of medieval manuscripts were well protected from the elements. Made to last, medieval manuscripts were treasured." AbeBooks: Who owned medieval manuscripts considering few people could read at this time? Sandra Hindman: "More people than you think. Churchmen and women, royalty and aristocrats, but also, by the end of the Middle Ages, 'ordinary people,' like doctors, lawyers, teachers, and even merchants. If 'a picture is worth a thousand words,' some people who owned medieval manuscripts may have just admired them for their pretty pictures. The same is true now." 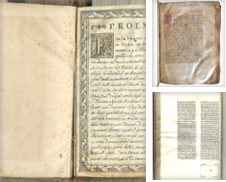 AbeBooks: What typically happened to a medieval manuscript once the original owner died? Sandra Hindman: "If a manuscript belonged to a monastery it often stayed there for centuries, if to an individual it passed by inheritance through generations of family members. It is rare to find a medieval manuscript with an unbroken chain of ownership. But, it happens. Signatures, book plates, and other annotations within books themselves often have much to tell us about the 'life' of the manuscript. A breviary (a book containing text for worship) from Northern Italy, illuminated on vellum, dated 1456, offered for sale by Les Enluminures for £46,000. AbeBooks: Surely medieval manuscripts are written in Latin? Sandra Hindman: "Not always. Latin is the language we find most often in medieval manuscripts, because it was the common language of the Church and of higher learning. But, you can also find medieval manuscripts containing histories, treatises, and poetry - even prayers and devotional writings - in native vernaculars such as medieval French, English, German, Dutch, Italian, and Spanish." 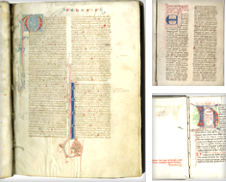 AbeBooks: What is the oldest manuscript that Les Enluminures has handled? Sandra Hindman: "Fragments of the Dead Sea Scrolls - twice (do these count?). Dating from Jesus' lifetime, they are the most celebrated archaeological find ever made. Also, the Liesborn Gospels, a manuscript from c. 980 made for an abbey in Westphalia and purchased from us by the German state in 2017 for three million Euros to return it to that abbey's museum." AbeBooks: We often see the term 'illuminated' - what does it mean? And how is it done? Sandra Hindman: "The term 'illuminated' comes from the Latin verb illuminare, meaning 'to light up or illuminate.' An illuminated manuscript is one whose pages shine with decorations of gold and bright colours. To create an illumination, which could be an initial, a border, or a full-page picture, the artist would typically start with a simple drawing outlined in lead or ink, add gold leaf, and, finally, fill in the outlines with paints. The rich hues of the paint derived from a variety of sources, including ground up minerals (like azurite or lapis lazuli) and plant extracts. AbeBooks: The gold in illuminations catch the eye. How was it done? Sandra Hindman: "Yes, artists used real gold to make illuminated manuscripts. Leaf gold was beaten into tissue-thin sheets, then stuck on the page with clay or gesso (a mixture of animal glue, chalk, and white pigment). Using the tooth of a wolf or dog, the artist polished the gold until it shone brightly. Artists also used shell (or liquid) gold composed of particles of gold held in suspension so it could be painted directly on the page." A Vulgate Bible (the standard Latin translation of the Bible by St. Jerome in the 4th century), an illuminated 13th century manuscript offered by Les Enluminures for £178,200. AbeBooks: Was there anyone particularly famous for being great creators of manuscripts? Sandra Hindman: "The Limbourg Brothers (artists of the Très Riches Heures), Jan van Eyck (perhaps the artist of the Turin Milan Hours), Albrecht Dürer (artist of Emperor Maximilian's Prayerbook). Are they famous enough? There is of course the Da Vinci Codex (with drawings, not technically illuminations) bought by Bill Gates for more than $30 million. Surely Leonardo counts!" AbeBooks: Another common term is 'Book of Hours.' What are they and why were they so popular in the Middle Ages? Sandra Hindman: "Books of Hours take their name from the arrangement of prayers within them for recitation during the 'hours' of the day, and they center on the story of the Virgin Mary and the life of Christ. The Book of Hours was the first text read all across Europe by all people at every level of literacy. Its words reached an enormous audience, more than any written text had ever done. It was the book from which medieval children were taught to read. It was a text which most people knew by heart. It was a picture book, then and now. Luxurious examples that are widely known include the Très Riches Heures for Jean, Duke of Berry. Even today, there are more Books of Hours in circulation than any other type of medieval manuscript." AbeBooks: Christianity appears to be the main theme of European medieval manuscripts. What other topics were covered in these manuscripts? Sandra Hindman: "Think of a topic and I will find you a medieval manuscript on the topic. The Seven Liberal Arts - grammar, rhetoric, logic, geometry, arithmetic, music, and astronomy. Birth and death, war and peace, love and marriage, eating and drinking, all aspects of daily life and pastimes, including gardening, horseback riding, hunting, fishing, games, fashion. Possibilities abound." AbeBooks: "Fantastic and mythical beasts seem to pop up regularly. Why is this? Sandra Hindman: "They are infinitely amusing, aren't they? Were they entertainment for the artist or the reader? Or, symbolism laden with hidden meanings? Take your pick. But, enjoy them!" Sandra Hindman: "Certainly there are Arabic, Coptic, Burmese, Sanskrit, Japanese, and many other types of manuscripts. Les Enluminures is highly specialized, however, and deals only with Western European manuscripts (along with some Hebrew and Greek manuscripts)."